Manta rays are distinctive flattened body fish closely related to sharks. Many people believe that manta rays are any round and flat animal, but the truth is that this is not so. There are only two species of fish that receive the name of manta ray and belong to the genus Manta, being considered the biggest members of the ray family. These are the reef manta (Manta alfredi) and the giant manta ray (Manta birostris), animals that exceed 3 meters wide and have the largest brains of all fish. Some people believe that fish are not very intelligent animals, but in the case of manta rays this may be completely wrong because their brain to body ratio is high. Their intelligence, behavior and reproduction are essential to understand them, and there is still much to learn. Therefore, many researchers are carrying out detailed studies for further information. Before 2009 people only knew one species. However, that year marked a before and after in the taxonomy of the genus, since the investigation exposed the existence of two species. Since then Manta birostris was called giant manta ray and Manta alfredi began to be called reef manta ray to differentiate it from its relative. These common names refer to characteristics of each species. Do you want to know them? Giant manta ray. It is the largest species of the two and reaches dimensions of up to 9 meters wide. It is physically very similar to the reef manta ray, but is distinguished by having a dark color around the mouth. It usually swims away from the coast and near the water surface, but it also gets close to reefs. It’s more migratory than Manta alfredi. The reef manta ray. The smaller of the two species tends to stay longer in specific sites and can be distinguished by the white color in its mouth. 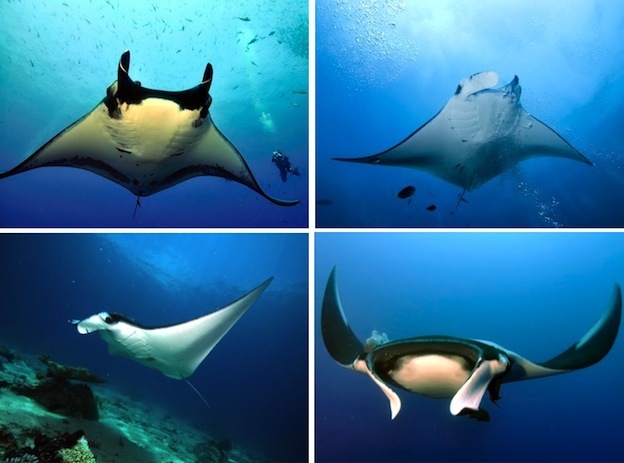 It dives to 400 meters deep, but usually is more coastal than the giant manta ray.